1) How do you define young adult ministry? Is it a ministry to a particular age group or a ministry to those in a particular life stage? Is it a ministry that is tangential to the larger congregation? Is it a ministry that is led by a staff person or group of volunteers? Is it even an area that receives attention in your context? 2) What is the purpose of young adult ministry? Is it to connect young adults with each other? Is it to form faith, strengthen identity or grow leaders? Is it to provide an outlet for those between youth and older adulthood? Is it to make sure that the traditions and history of a church community are passed down? These questions are not designed to overwhelm you; rather the hope is that they spark some inquiry into how and why your congregation engages young adults. 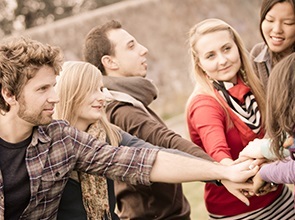 The ELCA defines young adults as post-high school individuals between the ages of 18 and 30. Anyone who has encountered people in this category knows that this broad age range encompasses a variety of life experiences, expectations and ideas about what it means to be a part of the church. The reality of life among young adults and the changing landscape of spirituality and religiosity in the United States all affect the way that congregations can be be in relationship with this amorphous group. Defining young adult ministry has to be specific to your context and has to be done in collaboration with actual young adults. Even if young adults aren’t present in your congregation, they are surely present in your community. College campuses, coffee shops, local bars and restaurants, the grocery store or farmers market are all places and spaces where young adults can be found. This is your assignment, should you choose to accept it: Make a plan of reaching out to young adults in your congregation and community throughout the summer. Step 1: Find a young adult. Step 2: Introduce yourself and ask if they’d be willing to have a conversation with you. Your hope is to learn more about them — what they value, what they think, what they want from life. Step 3: Engage in a conversation, remembering to listen to what they say. Look for points of connection, for similar interests. Step 4: Thank them for their willingness to share. Step 5: Ask them if they would recommend another young adult that you could talk to. The purpose of this reaching out is not to get young adults to come to church or serve on boards or lead a project. The purpose of this reaching out is to build relationships. Plain and simple. Are you up for the challenge?